The kind of dish that’s too hard and too fiddly right? Besides how on Earth do you create the all-important dipping sauce with enough flavour and without sugar? A little spicy and a whole lot of delicious is this dish and now a firm favourite in our house. 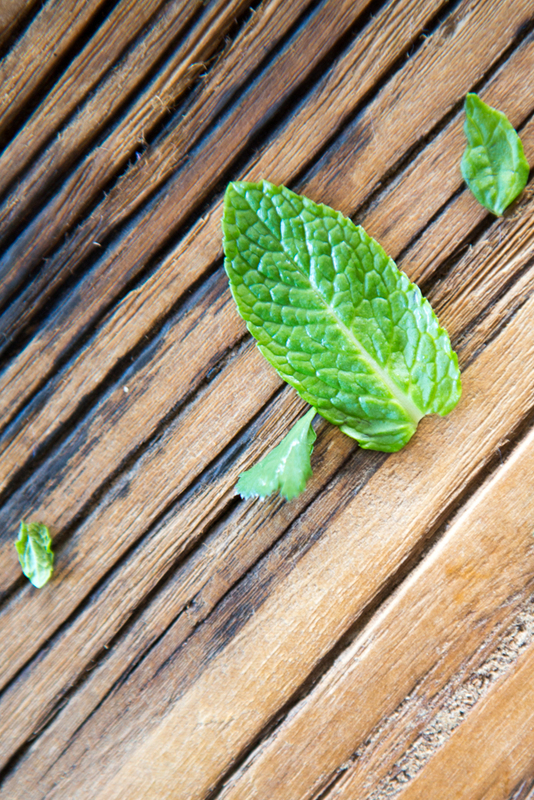 The coriander and mint both aid in digestion, are fantastic for your skin, a good source of vitamin C as well as anti-diabetic and anti-bacterial. The use of fresh raw foods means you are accessing the maximum benefits of these foods; from fibre to antioxidants and countless vitamins as well. The avocado provides healthy saturated fats – brain food – along with helping the metabolism and reducing sugar cravings whilst the use of tamari sees you enjoying a more taste-balanced product and all without the wheat that’s present in soy sauce. Most supermarkets sell tamari though you may need to check the health-food aisle. You could easily swap the chicken out for tofu or prawns if you prefer, or simply for another version of the recipe. 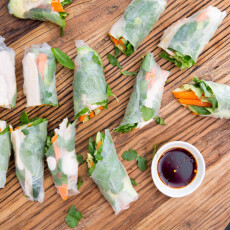 Don’t be put off by the perception that rice paper rolls are too fiddly and pain-staking because a 15 minute delicious lunch or dinner is right around the corner! The first time that I’d ever made a dipping sauce was when I originally came up with this idea – gosh I love when that happens! That in itself should tell you how easy it really is!! An added bonus to this recipe is that it can be made in advance, just be sure to refrigerate well. 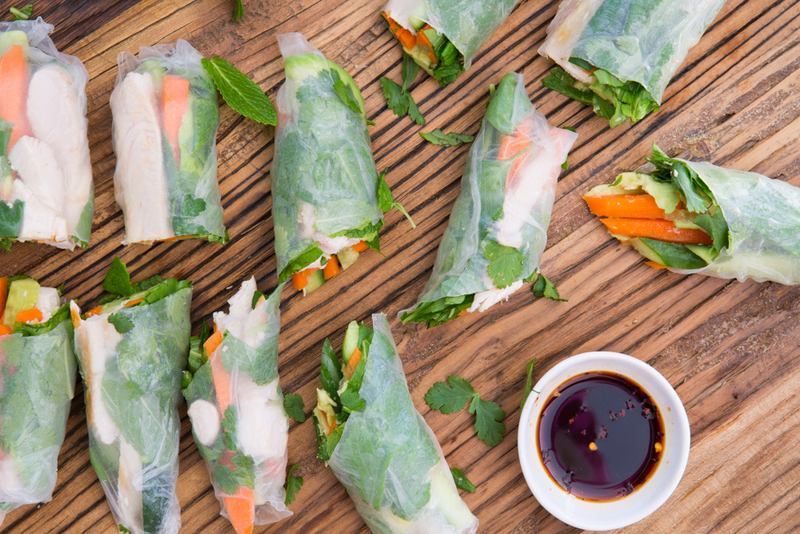 If you’ve made (or attempted) rice paper rolls in the past, my fool-proof method to activate the tapioca starch (what makes them soft) will hopefully ease your past pain! When creating this at home, I like to prepare the chicken and while that’s cooking, start on the vegetables and herbs; if you have some help in the kitchen, you could each take a job. As I prepare each vegetable and herb, I make various piles or fill bowls to ensure seamless and simple rice paper rolling later on. As you get to picking the herbs, you may think I’m insane and there’s just way too much, however this is where the awesome flavour and so many antioxidants are coming from so fear not! If you’ve got some leftover or BBQ chicken in the fridge, you could use that in the rolls as well. 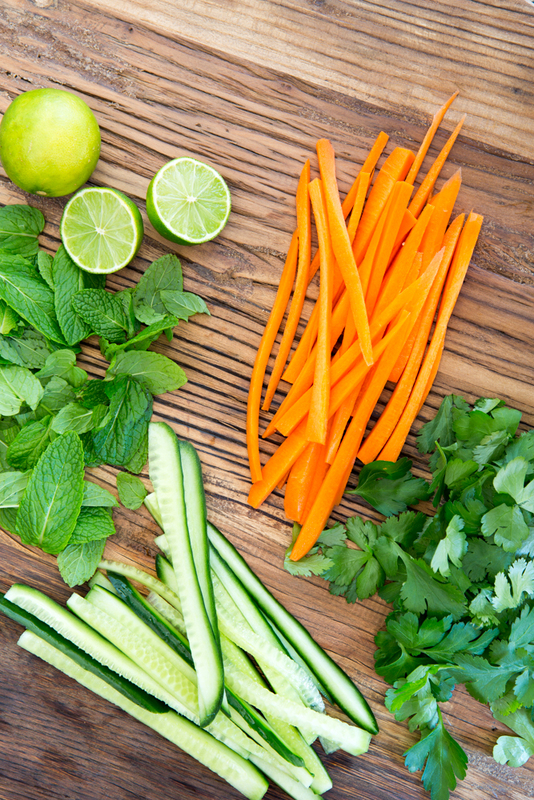 Final tip – cut those veggies thinly! A few more minutes makes a world of difference! And a seriously amazing prawn variation can be found alongside 39 other simple, delicious + nutritious recipes within my mini eBook bundle of the same name. 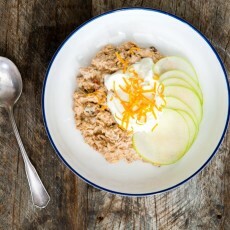 I love creating delicious and healthy recipes for you, all I ask is that if you like the look of this one you share the love with your friends, your co-workers, your mum – everyone! That’s fair right? 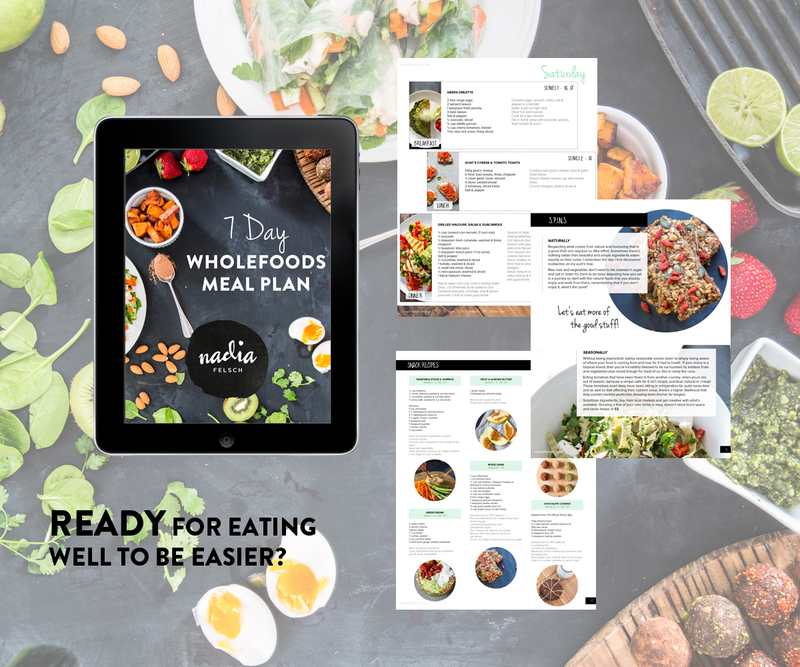 This one’s from my FREE 7 Day Wholefoods eBook – have you got yours yet? Sign up below to enjoy a whole new world of delicious whole foods and join me for exclusive love each week! 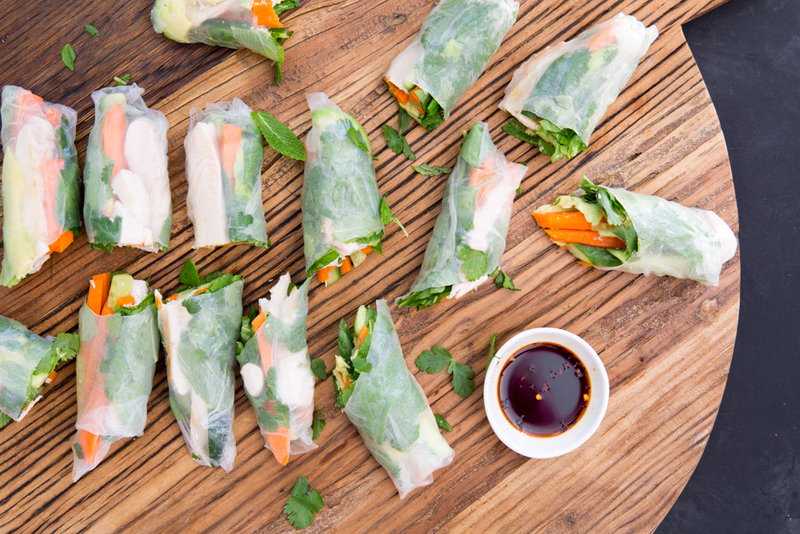 4 Responses to "Chicken Rice Paper Rolls with Chilli-Lime Dipping Sauce"
Wonderful! Happy to have helped out lovely!